Every year around this time I start to get the urge to make over something in my kitchen. 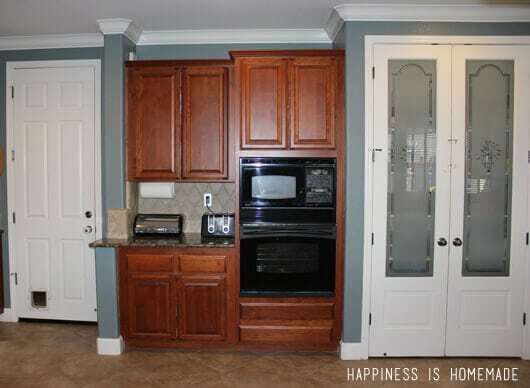 Last year the kitchen got a fresh coat of paint, which made my least favorite feature – the wheat etched glass pantry doors – stand out even more (and not in a good way.). I know that some people love etched glass, but it just isn’t my thing, especially when it’s paired with a wall color that turned out to be much more of a dusty country blue than we were envisioning. 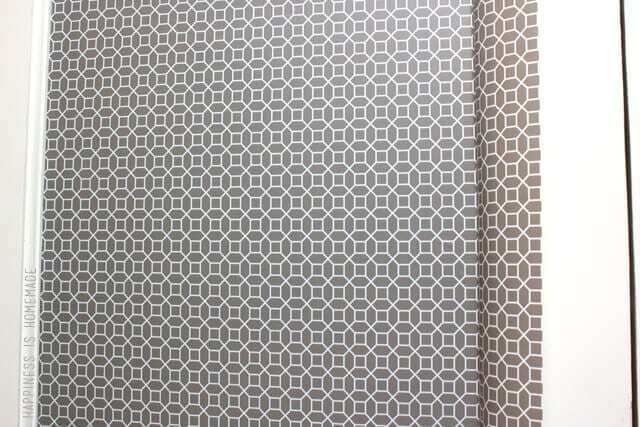 I really want to give the room a new coat of paint (surprise, surprise!) 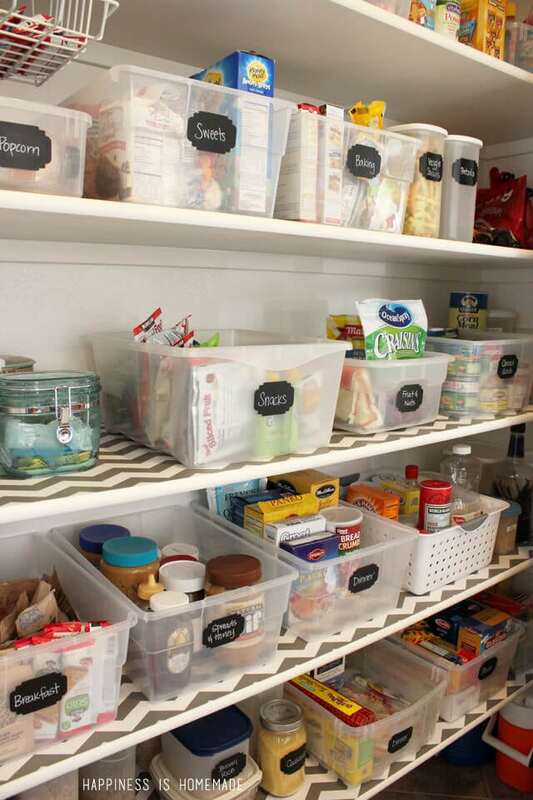 to make it feel more like ME, but I decided to tackle the one area that needed a makeover the most – the pantry. Holy moly, Batman, it looks like a tornado tore through there! (More like a tornado of three little boys!) 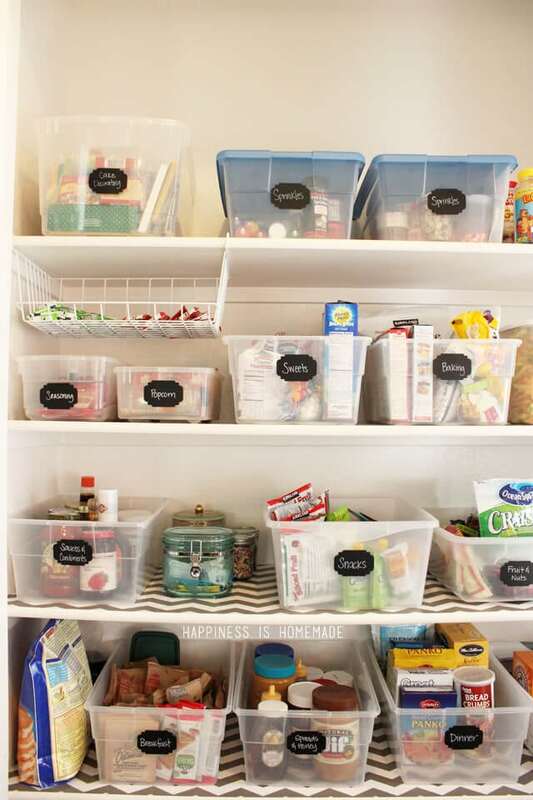 We’d organized the pantry awhile back with some plastic bins, but after awhile everything was all mixed up and messy. There were boxes and cans in the corners of the upper shelves that I couldn’t even reach…and four tubs dedicated to sprinkles and cake decorating? Sheesh! Time to consolidate! I decided that if I was going to tackle reorganizing the pantry that I also wanted to give the exterior a little facelift at the same time. 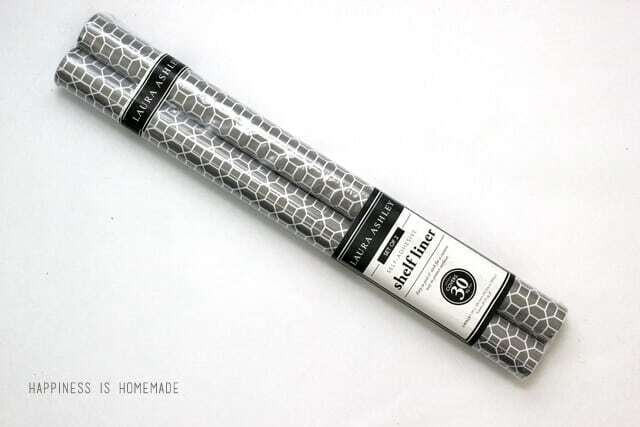 I bought some Laura Ashley geometric shelf liner and decided to cover up the wheat glass with it. It was way easier than I thought it would be to get the paper smooth and nicely laid. I started at the top of the door and pulled the adhesive backing down by about 8″ at a time, smoothing it out with an old plastic gift card along the way. The paper was wider than my door, but it was easily trimmed with an Xacto knife and a metal ruler as the final step. First, I recruited some helpers to take everything off of the shelves. 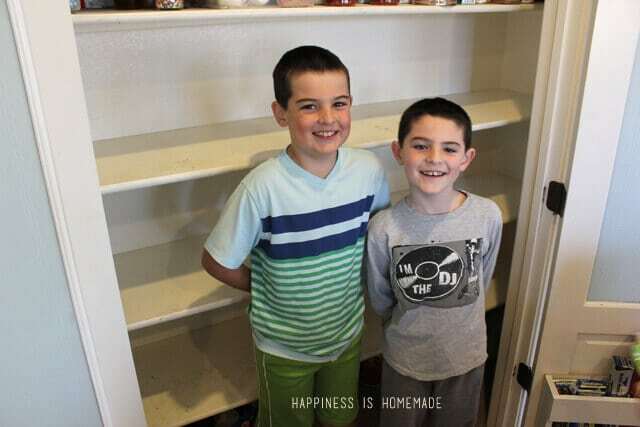 I gave them rags and spray bottles, and they willingly scrubbed down the shelves for me too. Even with all of the boys’ hard work, the shelves were really scratched up and had seen better days. 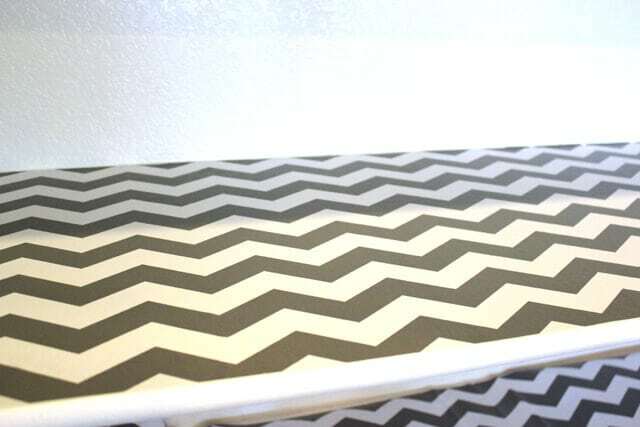 I grabbed some grey chevron shelf liner from the back of my craft closet (leftover from when I lined the drawers of my vintage yellow painted dresser) and lined all of the pantry shelves. I tossed out any expired foods (like the unopened Bisquik from 2011! Ha, keepin’ it real.) and made a donation bag for the food bank as well (with only non-expired foods, of course). 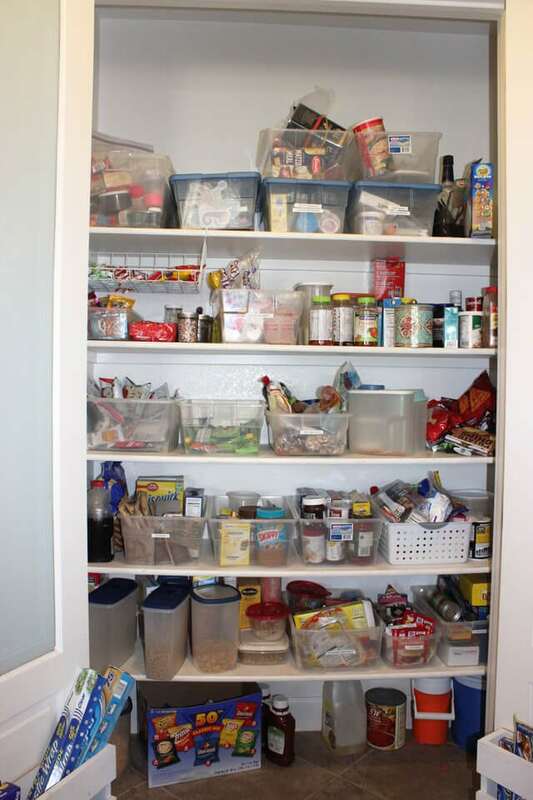 I started putting everything back into the pantry and grouping like items together in plastic bins and containers. 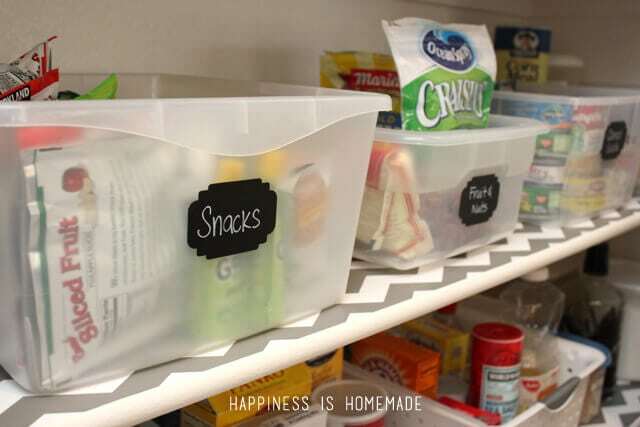 As much as I’d love a whole bunch of matching straight-from-the-catalog food storage containers, I just used whatever we had on hand, and it worked out well. Labels make it easy for my family to find what they’re looking for (and also to put it back where it belongs!). I cut chalkboard vinyl with my Silhouette machine to make mine, but you can also purchase pre-cut chalkboard labels rather inexpensively. The labels make a huge difference in encouraging everyone to put items back where they belong, and the fact that I can change the chalkboard labels as our food stock changes is totally cool. I made sure that the boys’ snack bin and the healthier food options are right at their eye level so they’re more likely to grab dried fruit or trail mix at snack time than Dad’s cookies. 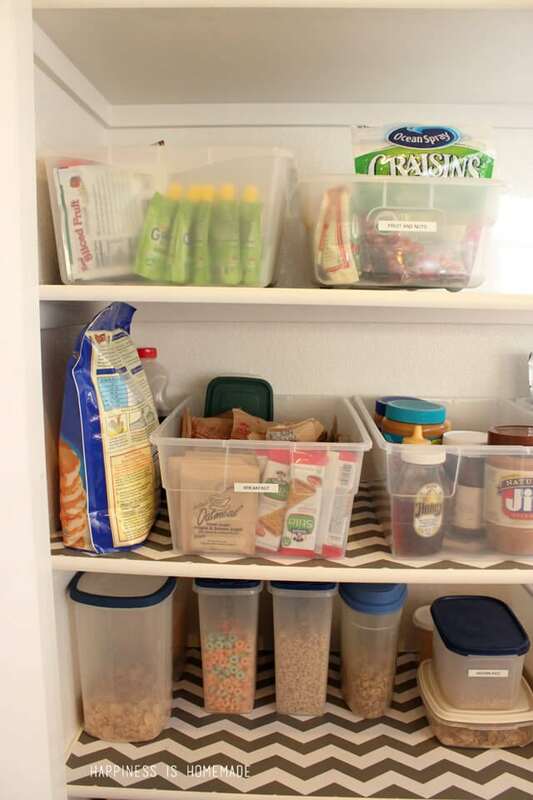 My husband built these holders inside of each door to organize the foil, plastic wrap, etc, and they are SO handy! He used the design from Shanty 2 Chic and modified it just a little bit for what we needed. Ahhh, so much nicer! With the warm weather that we’ve been having here in California this winter, I think this may have officially kicked off an early spring cleaning and organizing season for me! I love your solution to cover up the glass! The doors look amazing now! 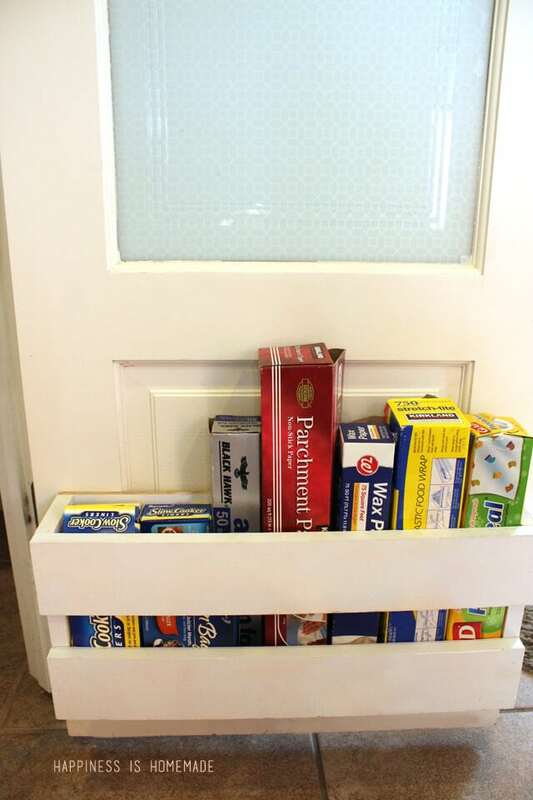 Beautiful and easy face lift for your pantry! Great job! 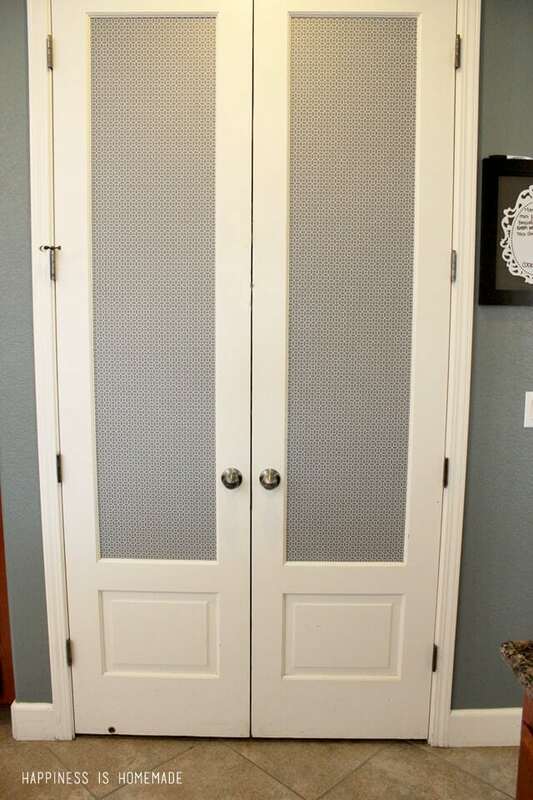 Love your idea o covering the glass in the door. Thank you for sharing. Love it! Wish I had a silhouette! Where did you find the clear plastic bins? Such great ideas. I really like that you grouped everything together based on categories. I’m going going to try to do the same thing. Thanks!